I almost swallowed my teeth. 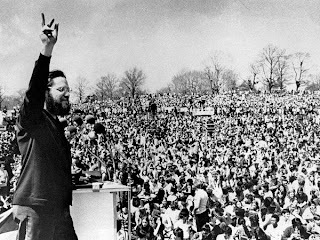 Ira Einhornâ€”a leader of nonviolence, drug, and free-love movements in the 1960sâ€”speaks at Philadelphia’s first Earth Day celebration on April 22, 1970, Across the U.S. the first Earth Day drew an estimated 20 million participants. Because usually fluff articles on the wonderfulness of Earth Day tend to be Stalinesque history, cutting out Mr. Einhorn’s involvement with the holiday. Because Ira Einhorn is better known as the “Unicorn killer”, a man who had abused women,Â and who murdered his girlfriend in 1977 for daring to leave him. He hid her in a trunk in a storage area of his apartment, and refused to let the police or even the landlord investigate the horrible smell or the dark stain coming from that area. Her name was Holly Maddux, and like other nameless people killed by the rich and politically connected, it was her family, not the local police, who sought her when she went missing, connected the dots between a man with a history of domestic abuse and her disappearance,Â and after her body was found, fought for 20 years to bring a man protected by powerful interests and at least two governments to bring him to justice. So, left out on bail, he skipped the country. How does one live as a fugative in Europe? With rich girlfriends, and with the help of patsies who covered up his trail and gave him money. So finally he was extradited and ended up in jail. It took the family 20 years to get justice, and the Unicorn killer now is behind bars for life, still claiming he is innocent. But Ira Einhorn is not a “normal human being”. He is a sociopath, who went into the anti war and later environmental movement to con people. But once he was finally convicted, his name disappeared from most reports of the history of Earth day….until now. His picture is back, hero of eathday, for all to see and “remember”, while never mentioning the victim of this monster. So I wonder: are the National Geographic reporters unable to “google”, orÂ like the rich and powerful who enabled him to flee, have they been “conned” by this monster, or do they figure, like his French backers, that we can ignore a murder that happened 33 years ago, and rehabilitate Einhorn’s legacyÂ back into Earth day celebrations. Nancy Reyes is a retired physician living in the rural Philippines. She writes on human rights at Makaipablog. 1 user commented in " The Murderer Behind Earth Day "